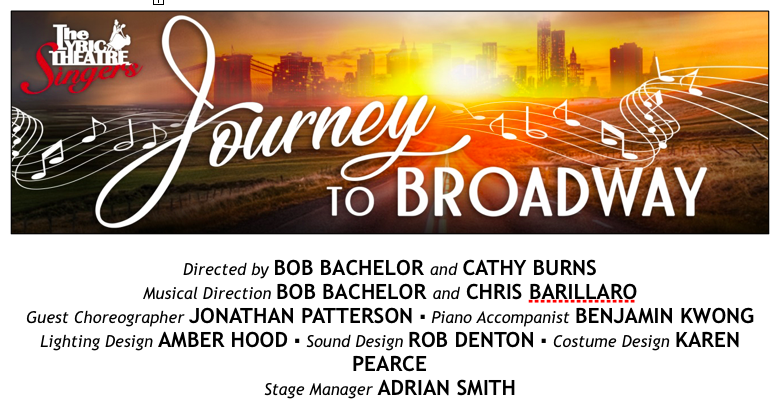 The Lyric Theatre Singers have booked a return trip to Concordia University’s DB Clarke Theatre June 14, 15, and 16 to present four performances of JOURNEY TO BROADWAY. This entirely new musical theatre revue, created by directors Bob Bachelor and Cathy Burns, features forty performers and five musicians performing a bevy of Broadway’s most memorable songs. The signature of a Bachelor-Burns show has always been the varied nature of the chosen repertoire. “Our cast members possess a wide range of talents and abilities that we consider when shaping the show”, assured Bob Bachelor. Cathy Burns continued: “With every passing year we see how the Singers have grown and developed, giving us more and more to work with for each annual Broadway revue.” This and the increasingly multicultural nature of the group—current performers have come from such countries as Australia, Egypt, France, Mexico, Morocco, Taiwan, and the United States to settle in Montreal—adds a rich diversity that is extremely inspirational to the artistic team. Join the Singers on their JOURNEY TO BROADWAY as they traverse the globe via the Caribbean, Russia, the American Midwest and the high seas! Scheduled musical stops include selections from: Anastasia, Chicago, Once on This Island, Company, Rent, Titanic, Waitress, the 2017 Tony Award-winning Dear Evan Hansen, and timeless songs penned by Rogers and Hammerstein, Rodgers and Hart, Kander and Ebb, Cole Porter and many others. The creative team of Bachelor and Burns is complemented by returning co-musical director, Chris Barillaro, guest choreographer, Jonathan Patterson, and rehearsal/show pianist, Benjamin Kwong. The Lyric design team is comprised of lighting designer, Amber Hood, sound designer, Rob Denton, and costume coordinator, Karen Pearce. Benjamin Kwong is joined on stage by musicians Paul Carter on woodwinds, Chad Linsley on synth, Mike De Masi playing bass, and Parker Bert keeping tempo on the drums. Helming the revue as stage manager is Adrian Smith. Be the first to comment on "Journey to Broadway, courtesy of the Lyric Theatre Singers"